But with this accomplishment comes a seriously hefty price tag. The Economic Policy Institute recently released data about child care costs in the U.S. that found 33 states, plus Washington D.C., have day care facilities that charge more than college tuition for a four-year public school. That's mind-blowing, especially for families with more than one kid. To think these numbers are tied to the cost of sending toddlers to preschool seems ridiculous, but to put it in perspective, Washington D.C., has the most expensive preschool costs in the nation, at $22,631 per year. Massachusetts has the second-most expensive costs for preschool, at $17,062 per year. 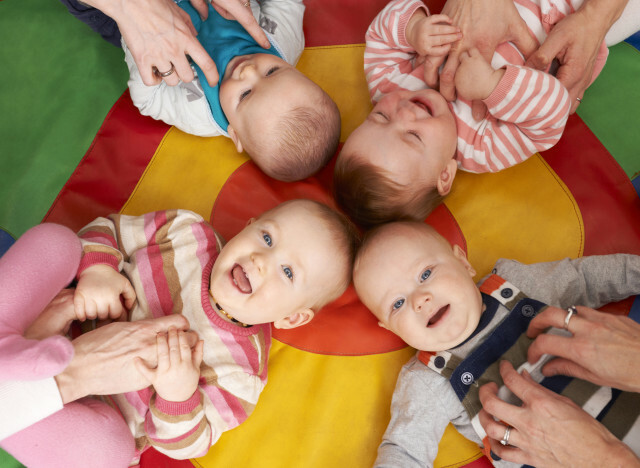 The numbers don't lie — paying for child care can get expensive and some parents who want the best for their kids may even overextend themselves financially. Just remember — maxing out credit cards or taking on debt to pay for child care can seriously damage your credit. You can see how your credit card balances are impacting your credit scores for free on Credit.com. Fortunately, some states' child care won't set parents back more than the cost of a mortgage. Using annual child care cost data from the Economic Policy Institute's study, along with their stats on annual housing, we've listed 10 of them here. With the average annual cost of housing at slightly more than $8,200 in Oklahoma, child care costs 17.2% less than average rent in the state. Wyoming parents face child care costs around $2,785 more per year than the cost of in-state tuition at a local college. Sending your little one off to child care in the Palmetto State costs around $70 less than in Wyoming, but it will still take about 12% of an average family's income. In Kentucky, families look at around $525 of their annual salary going to child care each month — and that's just for one child. The capital of California is more affordable than most of the states' major cities. But that doesn’t make it an ideal place for savers. Home prices still are high, and the median income in Sacramento is lower than the national median income of $53,482, leaving residents without a lot of wiggle room in their budgets to set aside money in savings. The unemployment rate in Bakersfield is the second highest among the worst cities for savers. However, the median income of those who are employed is higher than many of the other cities on this list. Housing costs also are more affordable, which is why Bakersfield ranks lower than most of the other California cities that are the worst places for savers. The median home listing price in San Jose is the second highest among the worst cities to save. It’s also one of America’s most expensive rental markets, according to CNN. But a high median income — as a result of its booming tech industry — helps offset the high housing costs somewhat and doesn’t make it quite as hard to save as other places on this list. This city on the Pacific Coast is a slightly better city for savers than neighboring Los Angeles. But the median income in Long Beach isn’t high enough to offset high housing costs, leaving residents with little left over to save. Stockton has two big strikes against it for savers: a median income that’s well below the national median income and a high unemployment rate. The city itself filed for bankruptcy in 2012 because fiscal mismanagement left it unable to pay its workers and fund the pensions of former city employees, according to Reuters. It emerged from bankruptcy in 2015. National Geographic Traveler magazine selected San Diego as one of the best destinations in the world. It’s certainly a nice place to visit, but it can be a tough place to live if you’re trying to save money. Although the median income in San Diego tops the national median, high housing costs can make it difficult to have money left over to save. The largest city in California’s Central Valley has the lowest house list price and lowest median rent in GOBankingRates' ranking of worst cities for savers. In fact, housing costs are lower here than half of the best cities for savers. The unemployment rate, however, is the highest of all cities on this list. The lower housing costs aren't enough to offset other expenses, so it's still hard to save money in this city. Miami has the lowest median income on this list of worst cities for saving money, which means it’s harder for the city’s residents to afford the high cost of living there. On the plus side, though, Florida has no state income tax. And the 7 percent sales tax rate in Miami is the lowest among the worst cities for savers. Forbes named Santa Ana one of the coolest cities in America in 2014 based on a ranking of entertainment and recreational amenities, diverse population and foodie culture. But that cool factor comes with a high cost. The median home list price and monthly rent — as well as average grocery and gas costs — are high, and the median income in Santa Ana is slightly below the national median, all of which can make it a tough place to save money. Frank Sinatra was right when he sang the following line about living in New York: “If I can make it here, I can make it anywhere.” If you can manage to save money while living in this city with its exorbitantly high cost of living, then, yes, you can probably find a way to save in most other cities. Not only is it hard to save in New York because housing costs and daily expenses are high, but the median income is below the national median. Anaheim is home to Disneyland Resort, which is great for visiting, but the city might not be the best place to call home if you want to save money. This city near Los Angeles rivals its bigger neighbor when it comes to a high cost of living. But a higher median income and lower housing costs keep Anaheim from being ranked as high as LA on this list of worst places to live if you’re trying to save money. Irvine is an affluent city in Southern California that has the highest median income of the 15 worst places for saving money. The city has been included in several "best places to live" lists in recent years because of its strong economy, well-regarded schools, and, as a planned community, thousands of acres of green space. But high home listing prices, rent, and daily expenses such as gas and groceries can take a big bite out of the big salaries in Irvine, leaving little money to save. For years, Oakland has been considered the cheaper alternative to San Francisco. However, it’s by no means a cheap place to live relative to other cities in the U.S. In fact, rent prices in Oakland increased more in 2015 than any other major city — including San Francisco — according to the 2015 Zumper National Rent Report. Considering the median income here is lower than the national median, residents have little left over to stash into savings after covering high housing costs and daily expenses. For the second year in a row, California’s largest city lands in the second spot on GOBankingRates' list of worst places to live for saving money. LA is considered the worst major city for housing affordability, according to a report by Southern California Public Radio. Although places such as San Francisco have higher rents and home listing prices, median income in Los Angeles is lower, making it harder to cover the high cost of living and leaving little room in household budgets to save. San Francisco retains its No.1 spot on this list of worst places to live if you’re trying to save money. Known for being one of the most expensive areas in the U.S., the City by the Bay has the highest median home listing price, highest median rent and highest average cost of groceries on this list. With such high housing costs and daily expenses, a median income of $78,378 doesn’t go far in San Francisco. Want to see which states cracked the top five? Check out the full article on Credit.com.